The chart above shows various emissions scenarios for anthropogenic CO2 emissions out to 2100 (expressed in Gigatonnes of C/yr). The black curve shows actual data according to BP from 1965 to 2011. The next four curves (green, yellow, orange, and red) are from the four representative concentration path (RCP) scenarios that are being used in the 5th IPCC report. These replace the old A1FI, B1, etc. You can find the data for them here (they ask for your contact details). The blue dashed curve we will come to shortly. I would like to critique the RCP curves which I find implausible in various ways. Let's start by characterizing them. 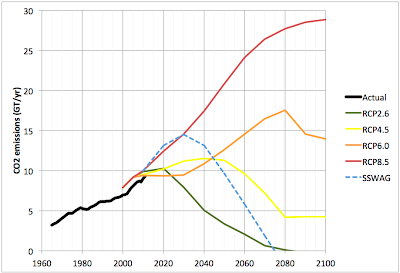 The highest emissions scenario is the red curve labeled RCP-8.5 (the curves are labeled by the total increase in radiative forcing by 2100, so RCP-8.5 corresponds to 8.5W/m2 of additional forcing by the end of the century). This is clearly the "business as usual" scenario that assumes we grow emissions at pretty high rates (they grew 2.8%/yr on average from 2001 to 2011) and continue to do so well out into the second half of the century. Emissions (not concentration in the air) only start to stabilize in the last decade or two of the century. At the other extreme, the green curve (RCP-2.6) assumes that the emissions curve starts to bend immediately right now, peaks in the next ten years, and then heads down over the course of several decades until it turns negative after 2080 (we start reabsorbing carbon from the atmosphere). The yellow (RCP-4.5) and orange (RCP-6.0) scenarios are intermediate ones with rather strange details - eg RCP-6.0 involves stabilizing emissions for the next couple of decades but then allowing them to go up markedly again after 2030. People have a strong tendency to be short-sighted and greedy and ignore distant and theoretical-seeming problems. When faced with an imminent serious threat that is graphically clear to them, people pull together and take strong action in response to the threat. Right now, humanity en-masse is pretty much ignoring climate change and growing emissions at a rapid pace as the developing world moves into the fossil-fuel powered industrial age (especially China in the last decade). Climate change is a very serious problem with a longish lag between action and consequence. However, well before the end of this century, business-as-usual will result in intolerable conditions over much of the land area currently used by civilization. I argue that while humans are short-sighted and greedy, we aren't so stupid that we won't call the fire brigade once the house is clearly on fire. Long before we get to the 2080s, we will be going all out to resolve the problem, to stop emitting carbon and to start reabsorbing it. We will be installing solar panels and wind turbines everywhere, making every building and vehicle as efficient as possible, installing grid capacity and storage all over to deal with the inevitable intermittency of renewable power, capturing carbon from the air and stashing it in buildings and underground and so forth. So in terms of scenario building, I want to see something that doesn't sharply kink at 2010 - there seems no reason to think that right now is the moment when the entire human race is going to get with the program. Instead, we should assume emissions will continue to rapidly grow for another decade, perhaps two, hard to say exactly. But then, as the consequences become clearer and clearer - the fires, the droughts, the floods, the storms, the food price spikes, people will start to panic. Then the political will to really tackle the problem will emerge - sooner in some countries (Europe has already made a start), later in others. Since the problem is not technically impossible, we will go about solving it. However, given the long life of infrastructure, this is likely to take several decades. Here I start at the RCP-8.5 level in 2010, grow at recent rates for another decade, then start to slow, with emissions peaking around 2030. After that, I assume we are in full-scale panic mode with dreadful (and steadily worsening) weather and frantic full-on attempts to convert all infrastructure to carbon neutral, and then go carbon negative in an attempt to stabilize the climate. Hence the curve drops rapidly in mid-century and then goes negative by the 2070s. Of course, I'm not going to claim that I know the exact shape, date of the peak, etc with much accuracy. But it has to look qualitatively something like that blue dashed line. Note that the concentration in the air will start to decline some time after emissions peak but before they hit zero as the natural world is absorbing quite a lot of our emissions (though this could change in future if natural ecosystems start to degrade rapidly enough under the influence of the changing weather - particularly the droughts). Obviously, we are going to experience a lot of climate change and if we fail to stabilize the climate in some zone reasonably tolerable for civilization, then the latter will collapse (and not leave much basis for human sustenance behind it either). I do think the blue path is quite risky. However, we won't experience a climate-change driven collapse without the system first making an all-out effort to solve the problem. Let's hope we succeed. "However, we won't experience a climate-change driven collapse without the system first making an all-out effort to solve the problem." Hmmm, sounds like you're predicting that at some point, all governments of the world will join together in solidarity to form a common line against a common threat. That works often enough in movies I guess... But I won't be holding my breath. Lucas: I'm thinking more like the response to the recent housing/financial crisis - all governments everywhere failed to anticipate the crisis or take reasonable precautions in advance, but once the crisis was incontrovertible and happening in front of our eyes, governments were propping up banks, flooding the system with liquidity, bending rules, and generally doing whatever the situation required to avoid complete meltdown. The worst outcomes were avoided. I think it will be similar with climate change, but in slow motion given the different timescales of the different problems. In terms of similarity to the financial crisis, I assume you mean that the worst results have been avoided "so far". Practically speaking, Europe is a mess. You have widespread social unrest in a number of countries, excessive unemployment of young men in many countries (never a good thing), and no compelling evidence that they've "solved" anything. The Chinese economy appears to be slowing. The US is "recovering" but in a fairly inequitable manner, one that does not seem to include much in the way of rising wages that could support increase consumption on which its economy is so highly dependent. So, yes, central banks are working together to basically protect the banks. It's not as clear that governments are working together to protect their citizens. I'm not sure I'm convinced that humans act cooperatively at a large scale (e.g., national or global) absent an accepted, obvious crisis with a recognized, agreed-upon cause. Worse, I think industrialized populations (especially Americans) are highly resistant to solutions that require suffering on their own part. I think the political, social and economic dynamics likely resulting from such an apparent climate crisis are likely to be such that governments may well be lucky to survive let alone work together to effectively mitigate the damage. For just one example, the types of changes often mentioned would require tens (hundreds?) of trillions of dollars of investment over time. Given existing debt and tax levels, it's difficult to see our current economic systems providing that level of financing investment. That seems to imply that in order to reach the point where we can actually make the necessary investments, we would first have to, at a minimum, radically change, or, at a maximum, replace our existing economic/monetary systems. That change, by itself, would likely be enormously wrenching, and take years, if not decades to make happen in democratic societies. This is just one example. And there are a host of these issuestab, all rooted in human nature. I have a very hard time gaming out a believable scenario, consistent with my observations of human nature, in which we join together to mitigate our major problems before the impacts of those problems dictate their own mitigating effects. Frankly, that is a scary and depressing thought. Your points re Europe are well taken, but at the same it's clear that around the time of the Lehmann bankruptcy we were facing a quite real possibility of a complete near-term collapse of the global financial system with basically incalculable harm to the global economy likely to ensue. Numerous governments acted with extraordinary speed and surprising creativity to (successfully) avert that outcome. If you extrapolated from their sluggish inaction in the lead-up to the crisis, you seriously underestimated them (and I know a number of people who made just this mistake). I think it will be the same with climate change - once the harm is widespread and clear and threatening to the overall stability of the system (as opposed to just some poor people somewhere) the system will act with a startling degree of resolution to solve the problem and protect itself. The danger is that the lags in the climate system are long enough that too much harm will be in the pipeline by the time everyone gets serious. "The danger is that the lags in the climate system are long enough that too much harm will be in the pipeline by the time everyone gets serious." I think this is an important thing to keep in mind. As unpleasant as it may be to consider, in life, it is entirely possible to create (or allow to develop) situations from which there are no "winning" outcomes. If we look at how each of the four terms on the right-hand side changes, we can get a trajectory for CO2 emissions. In the rest of the world, population peaks about 2060 after growing by 24%, then it declines, according to the UN's demographers. By 2100 we could expect the global rate of per-capita GDP growth to be under 1%. This is reducing at about 1% to 1.5% per year. The contributing factors are: an increasing contribution of low-energy services to GDP, and energy efficiency improvements driven by high energy prices, and opposing that, an increase in energy needed to mine progressively more diffuse resources. The latter driver may fade away in the last half of the century as countries finish building their stock of buildings and cars, and switch from mining ores to recycling old vehicles and buildings. On the other hand, sea level rise may make it worse by increasing the rate of new construction and making it impossible to recycle old buildings, etc. The main uncertainty in the P.G.E.C model is in the desired number of children per woman. (After a few years of a stagnant economy, governments may panic and try to boost the number of children.) The model assumes that solar, wind, and biofuels become the least-cost options for new electricity generation and transport energy, and we use fossil-powered generating plant until it's worn out or uneconomic. Investment is not a problem in the model. The model doesn't require large-scale co-operation: investment takes place in response to local demand only. On the other hand, the short-term thinking that this assumes means that we won't stop the build-up of CO2. We may well get what looks like a mass outbreak of international co-operation, but it will be when the underlying changes in population, GDP, energy intensity and carbon intensity growth/decline are at their most rapid. Politicians will hurry to get in front of the parade. I doubt that we will get warming to go negative (whatever happens to CO2 emissions), when you take agricultural emissions of greenhouse gases into account (currently about a tenth of the total, IIRC). If we add methane from melting permafrost, it's almost certain we won't be able to get "negative warming". Excellent post Stuart. I think your emission pathway is much the most realistic. I just did a post on the NIC's latest Global Trends report (http://therationalpessimist.com), which flags the possibility we get to 6 degrees Celsius by end century, so at least some people in the U.S. intelligence community are coming to understand the risk. 1) When faced with an imminent threat, humans come together but nation states don't. As all these climate impacts hit home, growth is going to take a sharp knock, but we will be required to increase global cooperation. History isn't very reassuring on this one. 2) Temperature sensitivity comes in at the high end, in which case we are locked into the worst warming outcomes even before going over your emissions hump. We have absolutely no control over this one. 3) The two out-of-model shocks we have seen with respect to Arctic sea ice extent retreat and northern latitude snow cover reduction extend to permafrost thaw rates. If permafrost related CO2 and methane release rates accelerate beyond expectations, then your curve will be very difficult to bend back down. My sense is that we may be forced to fall back on a geo-engineering response if we are unlucky with any of the above three. I know about all the problems with geo-engineering such as continued ocean acidification and so on, but it may end being the "least-bad' alternative. > "the house is clearly on fire !" < , and You do know it, don't You ? Beside this, where are we going to take the energy from in that 2030 - 2040 time frame to make all these changes you are talking about? > As in "life must go on as well.."
Blue scenario ... Really ? What could possibly go wrong ? Hope dies last I guess, lets stay positive. Still, I like your Blog a lot, Cheers ! I would agree with Manolo - the house is on fire now. The oft quoted line from the IPCC 1990 report concerning "rapid and unpredictable non-linear changes" with only 1 deg C rise in atmospheric temp is quite evident in arctic sea ice loss, for example, which seems to be impacting weather in ways far earlier than most models predicted, is the most obvious example. Hysteresis times - I've read that today's CO2 density about 394 PPM will be around for 1000 years - are far longer than the "blue line" prediction in the chart above, making it impossible to return to per-industrial climate. Optimism, especially techno-optimism ("Creative Solutions For Problems We Cause) in the face of actual evidence is delusional, though I suppose, comforting to those who can maintain it. It's not really helpful. Manolo, Mr Sunshine: I agree the writing is on the wall for those willing to pay attention to the data. Most people are not paying attention and don't want to pay attention because the news is not good. And if you just look out the window, it probably looks more-or-less the same as it did thirty years ago. Unless you've been actually in the path of one of the big disasters, and probably their minds are starting to change (eg Sandy caused some shifts in New York politics around this issue I think). I think it has to affect people where they live, or more likely shop, before they really take it seriously. That's why I don't think we are particularly close to peak emissions. I hasten to add that I'm not *advocating* the blue curve. If it were down to me, we'd be making a fast-as-possible 10-20 year dash for global carbon neutrality starting now. The blue curve is just my best guess as to what will actually happen, knowing something about people and something about climate change. The scenario based on your four points does seem reasonable. However, there is another point to consider which does not change your blue curve but changes the quality of life for many given your curve. Many people have the unfortunate trait of being power hungry. Those with this trait will attempt to use any crisis to gain long-term advantage over others. Given their position, members of existing elites tend to both have this trait and also have the wherewithal to act on it. It seems pretty clear that our elites will use the climate crisis to gain long-term advantage over the rest of us. One only has to look at the financial crisis you brought up and see how it led not to pain and suffering for the financial elites -- who were the main cause of the crisis -- but to pain and suffering for the 'common people'. Look at the attempt to dismantle of the social safety net in many European countries and the more general attempt to rearrange European societies along more capital friendly lines to get a glimpse of the world when the climate crisis starts to really hurt. Take a look at Naomi Klein's Shock Doctrine for a full explanation and historic examples. I agree that (most of) the 1% will push for their own interests - whether or not there's a climate crisis. Periodically, the 99% need to push back hard enough (which I guess just happened a bit with the tax rises that are part of the fiscal cliff deal). Thus, Europe already has sufficient comfort to worry about climate changed (aided by an understanding that the North Atlantic drift might go away if the Greenland icecap melts). North America, via the shrinking arctic icecap, and increasingly powerful weather are also gaining interest in climate change. Happily other regions/cultures can benefit from the low-carbon advanced of others, so the profile (timescale and peak) for each region to go through this profile can be shorter and and lower for regions now charging up the development cycle. The carbon emissions of societies building infrastructure (housing, roads, commerce and factories) and transport equipment is likely more rapidly growing than societies with established infrastructure and transport. Given that there are more people in BRIC countries becoming middle class than there are people in North America and Europe enjoying a middle class existence, the blue dashed curve cannot be expected to start to show a lower slope until the majority of that build-out for the majority of that emerging middle-class has occurred. Minor reductions in the near term by Europe and North America will not offset growing emissions in the BRIC middle-class. Stuart: "I'm thinking more like the response to the recent housing/financial crisis..."
Which was, at least IMO here in the US, largely a matter of treating symptoms rather than causes. I can envision a plethora of water storage and transport projects to enable increased irrigation; expansion of programs like LIHEAP to subsidize air conditioning costs of the poor and elderly; perhaps an effort to convert coal-fired generators to natural gas. One of the complicating factors will be that the best of the solar and wind resources are too far from too much of the population. 36% of the US population live in the 15 states along the Atlantic Coast (I include Pennsylvania, as Philadelphia is a major Atlantic port). The best of the inexpensive onshore wind resources are west of the Mississippi; the best of the solar resources are west of the Rocky Mountains. Although more research and info is needed, I'm becoming increasingly enthused about the potential of biochar to actually help reduce CO2levels once we humans get serious about that. It looks like it has the potential remove nearly 2 billion tons of carbon per year from the air, while at the same time producing some energy. Stuart. I think a critical part of changing hearts and minds will be to persuade the 1% that it is in their interest to act. GMO's Jeremy Grantham is a leading figure here as he asks "Have they no grandchildren?" I would hope that others in the financial industry will come to understand this message as the years roll by. Yeah - I see us doing that at a pretty big scale too. Also, incorporating biomass into buildings (eg agriboard, strawbale, looks really good to me since we need to build a lot of buildings anyway). Interesting hypothesis. Are you familiar with the work of Kevin Anderson? He's the deputy director of the Tydall Center, so has some credibility. He models the "carbon budget" needed to stay below 2 degrees. As I read it, the latest peak would be 2025, and that would require declining emissions by about 60%, in 2026. 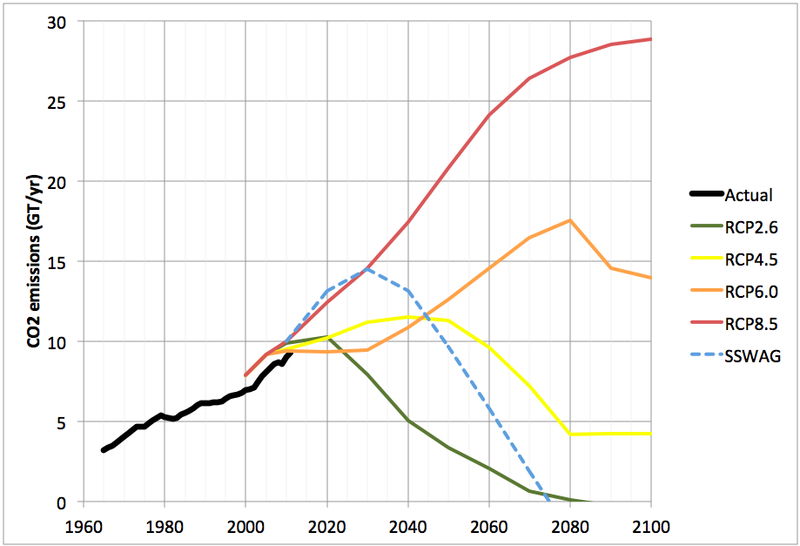 So, I'm not sure how your 2030 peak would play out. I'm guessing it would still result in 4 degrees, and probably pass the tipping point for self reinforcing heating. The last climate conference clearly decided to ditch prevention, and adopt mitigation as the practical response. That's the direction that _all_ the policy momentum is headed--including for example all the discussion in the aftermath of Sandy. It seems to me that this is what the "house is on fire--time to panic" policy response will focus on. Who knows how long that will continue to be convincing to the policy-making class?--but it fits their social position, that's been their entire socio-political strategy since Reagan/Thatcher/etc. So they'll hang on to that for a good long time. This suggests to me that the problem with the model proposed (population x GDP x BTU x carbon) is the assumption that human population will not crash. Which it will--and sooner rather than later, because the world food economy is pretty fragile. I suppose in the abstract we might interpret this as good news--fewer people, a disrupted industrial economy . . . I get it. But: once the population crash begins, almost all available resources will be sucked up by _further_ mitigation--i.e., saving as many lives as possible, in the immediate term. So at that point, the "house-on-fire-panic--massive response" equation is likely out the window. So it seems to me that if the aim is to have a policy option to offer decision-makers when the panic after the panic sets in--when the political class realizes that mitigation will not actually save anyone--then it has to be a policy option that is workable once impacts have reached the point of human population crash. That is, in those political/financial conditions. It seems to me there is really only one option in this scenario: a biotech solution that can reduce CO2 concentration with extreme rapidity and with virtually nil investment. That is, a fast-breeding CO2-fixing micro-organism. So the task is simple: to get the biology departments of the top 20 universities in the country to focus on how this is done. How do we create a bug that will rapidly and drastically reduce atmospheric CO2 to a viable level, but not create a runaway CO2 crash (such that we then induce an ice-age)? This sounds like kooky science-fiction hysteria, right? But if you follow how the world food economy works . . . I don't think so. About 5 years ago I read the excellent book ‘Fixing Climate’ by pioneer climatologist Wallace Broeker. In it he highlighted the work by a Columbia University Physicist: Klaus Lackner. He has developed a highly efficient carbon scrubber, effectively an artificial tree. 1 container sized machine can scrub 1 CO2 ton per day. 60 million machines could scrub all our current yearly CO2 output. And before anyone says we can’t make that many machines fast enough, ask yourself how many cars are built in the US alone in a year? These units can be located near the places you would store the CO2, as from the air you can capture CO2 anywhere. This captured CO2 could be stored initially in old oil wells or under saline aquifers. Later industrial scale CO2 fixing would probably have to be employed. This is not even that costly to do. Mass produced each unit would cost about $25,000. About 1.5 Trillion dollars for 60 million units. To put that into perspective the US has spent what, 6 – 7 Trillion on the war in Iraq and Afghanistan already? Even if it cost another 2 or 3 trillion to store or fix the stuff, it is not out of reach. Just think of all the jobs it would create…. A whole new industry in fact. If anyone reading this blog or these comment is really interested, it is pretty simple to find out about this idea and to see it is actually feasible. I wouldn't dismiss the green "RCP2.6" curve out of hand. Total carbon emissions may indeed start to trend downward in the next few years because of peak oil. More-expensive oil makes extracting other fossil hydrocarbons like coal more expensive, and coal and natural gas resources are also becoming more expensive to extract. While rising technological prowess and population has caused a dramatic increase in humanity's efforts to extract fossil hydrocarbons, the returns on this investment are decreasing. At the same time solar power installations are increasing at an exponential rate, which is likely to continue for decades as fossil energy prices itself out of the market over the next couple of decades. "Lucas: I'm thinking more like the response to the recent housing/financial crisis - all governments everywhere failed to anticipate the crisis or take reasonable precautions in advance, but once the crisis was incontrovertible and happening in front of our eyes, governments were propping up banks, flooding the system with liquidity, bending rules, and generally doing whatever the situation required to avoid complete meltdown. The worst outcomes were avoided. I think it will be similar with climate change, but in slow motion given the different timescales of the different problems. " Using that analogy, much of the money was spent to bailout the people who did the damage, while doing little to prevent future damage, or to mitigate current damage. And as soon as the elites were taken care of, the EU immediately decided to take advantage of the crisis to f*ck every non-elite over, and the GOP did the same, to the best of it's ability. Stuart, I notice that your SWAG scenario is rather extreme; there's a tiny bend around 2020, but the bulk of the action is that somehow right around 2030 the curve goes from positive to negative. This seems to assume incredibly drastic worldwide action within a decade. Not only that, but there seem to be a lot more positive feedback cycles than negative feedback cycles. For example, under the high emissions scenario we'll lose all summer Arctic ice pretty soon on, and the permafrost will be giving off tremendous amounts of methane. One thing to remember is that science is conservative; if a particular effect can't be proven, it implicitly enters the model as a soft zero. Until recently Greenland glacial melting wasn't counted, because the increases hadn't been measured yet. When they were measured, it was clear that the previously-imagined multi-thousand year lags were decadal lags. The third big factors are the 'chunkiness' of the climate. Long before the averages will kill us, the peaks will kill us. When once-a-century events become once or twice a decade, a lot of damage can be done very quickly. Also, minor regional switches can kill - Australia is now being hammered by the fact that the main rain belt has shifted a bit south, falling more on empty ocean. If a region which is already drying a bit moves into a drought cycle, what would have been a normal drought cycle might be much drier and longer, and start with already-depleted groundwater. I think that the proposed scenario may come about, but probably because of societal collapse. There is no such thing as "nations" and "national government", and a focus on them and the assumption of democratic control does not accept the way the world really works. The elites of the world benefit massively from the current way things are, and have greatly increased their benefit in the past few decades. Their wealth and power are based upon growth (share p/e values, interest payments on loans, real estate values etc.) and provision of crumbs to the rest. A true acceptance of climate change would require huge wrenching adjustments that would open up questions of "fair shares" and the acceptance of sustainability rather than growth as a reality. Until the elite "get" that they cannot build their own survivable lifeboat they will not accept the changes needed. They have been fantastically successful at socializing costs (the financial bailouts, the last one being only the latest) and shifting blame for the outcomes of their misdeeds (we need to cut deficits by cutting pensions etc. rather than confiscating some of their wealth to pay for the result of their recklessness and short term profiteering, or god forbid just reinstate all the previous tax cuts). Unfortunately, the effects of climate change both lags causes, so reducing emissions now will not immediately stop warming, and seem to be in the process of triggering the bifurcative changes inherent in natural complex systems. The earth will not stop at 2 degrees, as 2 degrees triggers changes that will move to 3 degrees and so on. We are on the edge of a cliff thinking that if we step off we can always get back to the top of the cliff. The earth will get back there, but in a timeframe in which our civilization will be an ancient mystery. Unfortunately, it won't look like the Mojave, which is dry because there's a couple of reasonably large mountain ranges keeping the rain from reaching the desert. It will probably be worse: it's not the heat, it's the humidity. The issue has been brought up by Dr. Steven Sherwood and others (e.g. http://www.pnas.org/content/107/21/9552.full): if the wet bulb temperature exceeds 35oC, it becomes impossible for humans to lose energy by sweating. These are known in the military as "black flag days." This is about the relative humidity, and there are a number of ways to get there, involving high heat and lots of water in the air. 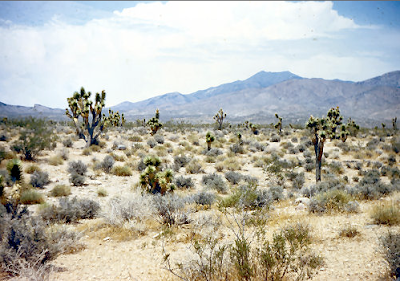 Many days of 100 degree weather aren't a huge problem in the Mojave, because it's so dry. Well, actually it's freaking uncomfortable to work out there, but if you're acclimated, it's not impossible. This is not the case if it's over 100 and raining. Working in black flag weather is almost impossible, and most people are advised not to try. Air conditioning is mandatory for people to survive. How crops survive is not clear, but perhaps some will. So actually, the business as usual model is quite bad: it shows some places in the US will be uninhabitable in the summer. At first glance, it appears that there's a good correlation between those denying climate change and those most likely to experience the black flag, but that could be my bias kicking in there. Great article otherwise: I hope your SSWAG curve comes out to be mostly right.